Beverly Hills pianist for hire Marc Bosserman continues to play as often as possible all over the Los Angeles/Beverly Hills area. First off, Marc started to play the piano when he was 7 years old. His father a university professor bought a piano for the family. Actually, the family would sing often as both parents loved to sing just for the fun of it. Marc Heard someone play “Heart and Soul” and he made the person show him how to play it. Next, lessons started and along with the Beethoven and Bach, Marc started to play every song anyone who could show him how to play it. Eventually, his love for music only increased as he entered Church and School music programs. And then, he sang in rock bands and played with the concert band as a drummer-percussionist with for concerts in the park. At 23 he started to make a living as a pianist in Hawaii in the resort areas of Waikiki. Within days he was playing 7 days a week and often several times a day. 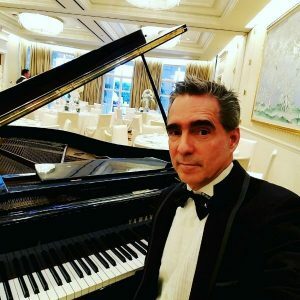 More recently, about10 years ago ,Marc decided to go full boat as a Pianist in the Los Angeles area. Consequently, he started taking any and every gig that he could. His school of thought has been that piano players play! And to make a living, one needs to deliver as much musical joy as possible. So, besides playing many private parties in the Beverly Hills Area eventually, Marc was playing a private party at the World Class Waldorf. One of the management at The Waldorf heard him play. Consequently, he was asked to play there for the Sunday Brunch. Brunch and on Thursdays nights. And is always looking for new venues, new people to entertain. New songs that people might love! There are many great reviews on Yelp!